Nicotine addiction and tobacco use wreak enormous worldwide health consequences, including more than 400,000 deaths in the United States each year from tobacco-related diseases. Most of this health toll involves disease related to the effects of inhaled smoke on the lungs and respiratory system and on the heart and circulatory system. However, recent NIDA-supported research has demonstrated that a compound found in cigarette smoke reduces levels of an important enzyme throughout the body--in the spleen, kidneys, and brain as well as the lungs. The enzyme, monoamine oxidase B (MAO-B), plays a critical role in breaking down neurotransmitters and helping to regulate blood pressure. Too much or too little of the enzyme can affect mental or physical health. Dr. Joanna Fowler and colleagues at the Brookhaven National Laboratory in Upton, New York, and the State University of New York at Stony Brook used positron emission tomography (PET) imaging to show reduced levels of MAO-B in the kidneys, heart, lungs, and spleen of smokers. "When we think about smoking and smoking toxicity, we usually think of the lungs," Dr. Fowler observes. "But here we see a very marked effect of smoking on one of the major enzymes in the body, and we see that this effect extends far beyond the lungs." 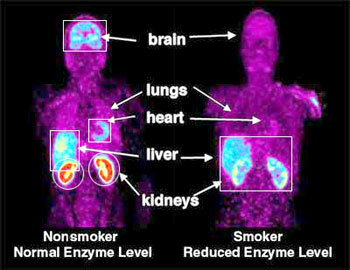 PET scans compare the distribution of the enzyme MAO-B in a nonsmoker and smoker. Circled areas indicate the highest MAO-B concentrations, areas captured in squares show intermediate levels, and areas with the lowest concentrations are unmarked. The smoker has lower MAO-B concentrations in peripheral organs than the nonsmoker. In earlier research, the Brookhaven scientists--whose research also is supported in part by the Department of Energy and the National Institute of Biomedical Imaging and Bioengineering--had found decreased levels of MAO-B in the brains of smokers. "Because smoking exposes the entire body to the tobacco compounds that inhibit MAO-B, we believed it had the potential to limit MAO-B activity elsewhere in the body," Dr. Fowler says. The study involved 10 men and 2 women (average age 41 years) who had been smoking for an average of 21 years. Each participant underwent PET scanning of his or her torso after receiving injections of radioactive MAO-B tracers. When the researchers compared these scans with scans previously performed on nonsmokers, they found that MAO-B distribution in the heart, lungs, kidneys, and spleen of smokers was 33 to 46 percent lower than levels seen in nonsmokers. The reduction in MAO-B levels is not due to nicotine, but to an unidentified component of tobacco smoke--one of roughly 4,000 chemicals to which smokers are exposed with each puff. "With the whole body exposed to the thousands of compounds in tobacco smoke, we need to be aware that these may contribute to the physiological effects of smoking," Dr. Fowler adds. "Nicotine establishes the addiction, and continuous smoking maintains levels of all these compounds throughout the body," Dr. Fowler says. "The health consequences of reduced MAO-B levels in the organs are unclear. There may be adverse effects that are indirect and associated with the dietary substances or environmental compounds normally broken down by the enzyme. At the very least, however, it is clear that enzyme levels in smokers’ peripheral organs are significantly affected by their tobacco use." 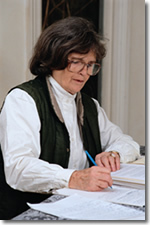 Fowler, J.S., et al. Low monoamine oxidase B in peripheral organs of smokers. Proceedings of the National Academy of Sciences 100(20):11600-11605, 2003.